It's always exciting to know that someone has looked at my work and then liked it and then shared! 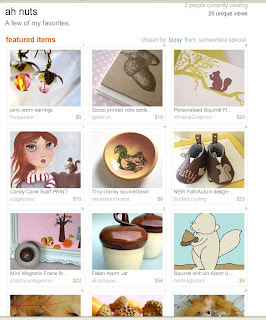 Well, Stacey at bipsy on etsy did just that with her darn cute Treasury titled "Ah Nuts". Those are my squirrel note cards in the top right. Are those squirrel booties cute or what?